(1939) Harbor House Cafe, Sunset Beach | Remains of L.A. 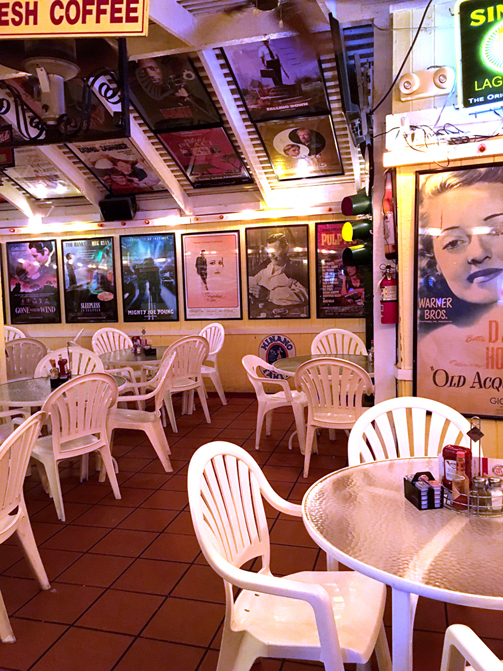 I headed down to the Harbor House Cafe because I’ve been worrying about how many restaurants on the list are south of L.A., where I don’t go very often these days. I used to; I lived in Orange County for years, but now that I’m in the valley I almost never get that way anymore. So when I found myself already fairly far south for a doctor’s appointment that didn’t take as long as I’d expected, and with a particularly good audio book to listen to, I decided to drive down to Sunset Beach. 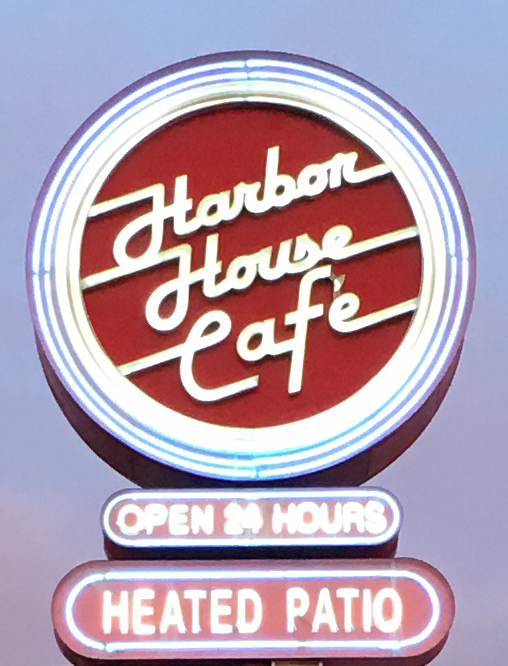 I used to eat at the Harbor House Cafe all the time, when I lived in Huntington Beach and worked at Quicksilver Software, because it was open all night and I kept odd hours back then. I’m not sure I’d ever seen it during the day before. I was less than halfway there when there was an accident or something and traffic on the freeway, all but stopped. So I got off at a random exit and told my GPS to take me on surface streets. It was delightful. 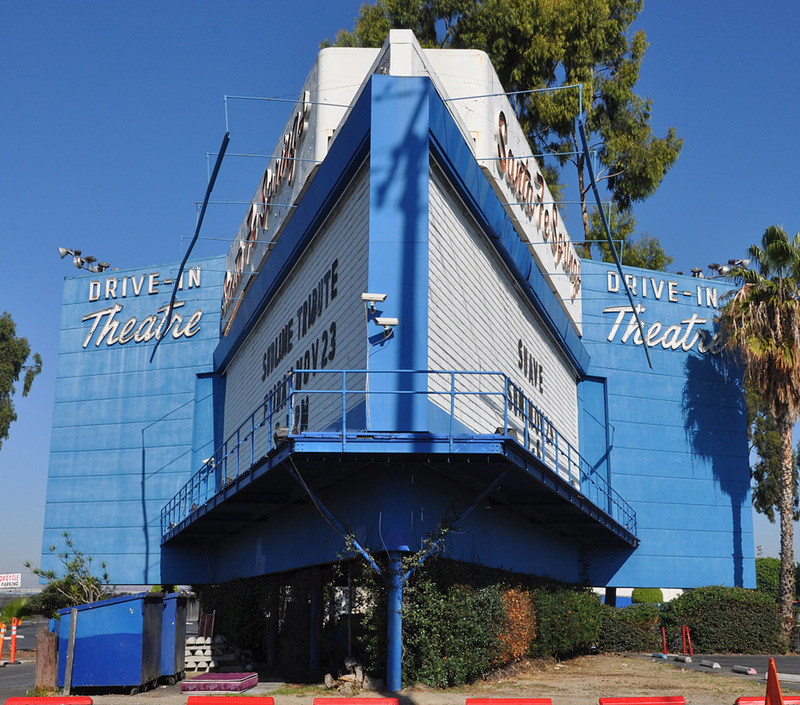 Didn’t take much longer and I got to drive past all sorts of places and things I’d never seen before, like the beautiful old sign for the Santa Fe Springs Drive-In. 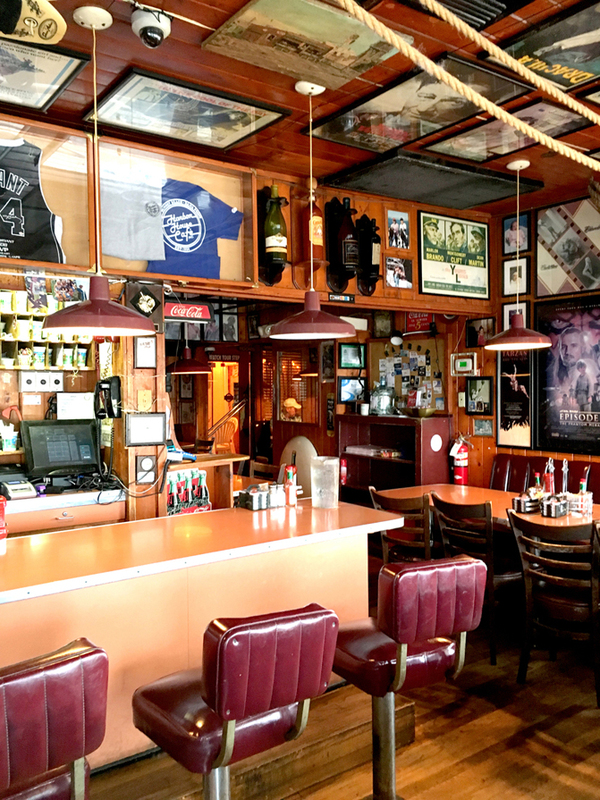 -Orange tables and maroon booths, a long orange counter with maroon seats, decorations make it seem busy and cluttered, but in the best possible way, old movie posters all over the orange wood walls and also on the orange wood ceiling, also on the walls are movie star headshots, beer ads, framed t-shirts, oversized wine bottles plus one oversized bottle of hot sauce, hundreds of snapshots of customers. There’s also a small surf board hanging from the ceiling. Leading from the front room is an oddly-shaped room, maybe really just a wide hallway, with booths crammed in at odd angles, beyond that is the back patio which has a very different feel, with white walls and white furniture and orange floor tiles, but still lots of movie posters. 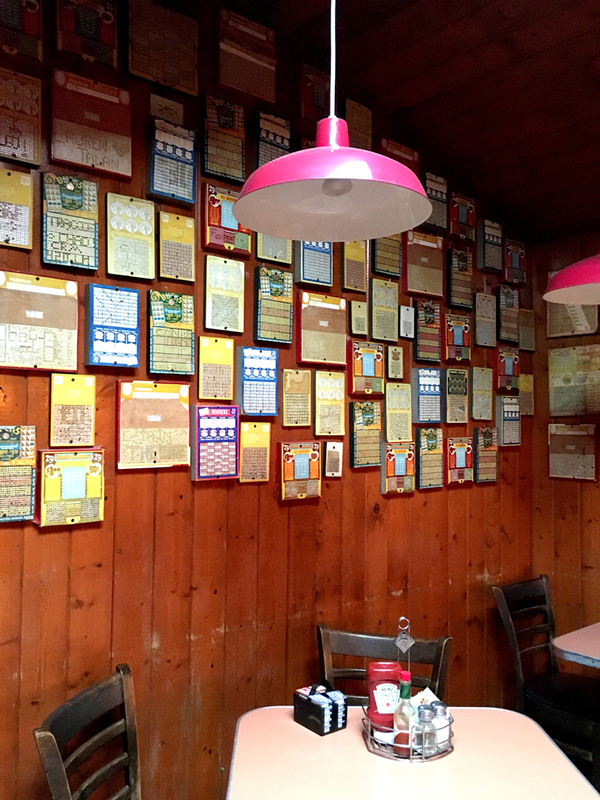 The back corner of the patio has a small separate room with the walls covered in what seem to be old tin boardwalk games, they look like oversized lotto tickets with holes punched in and they are magnificent. I want to cover my own walls with them. 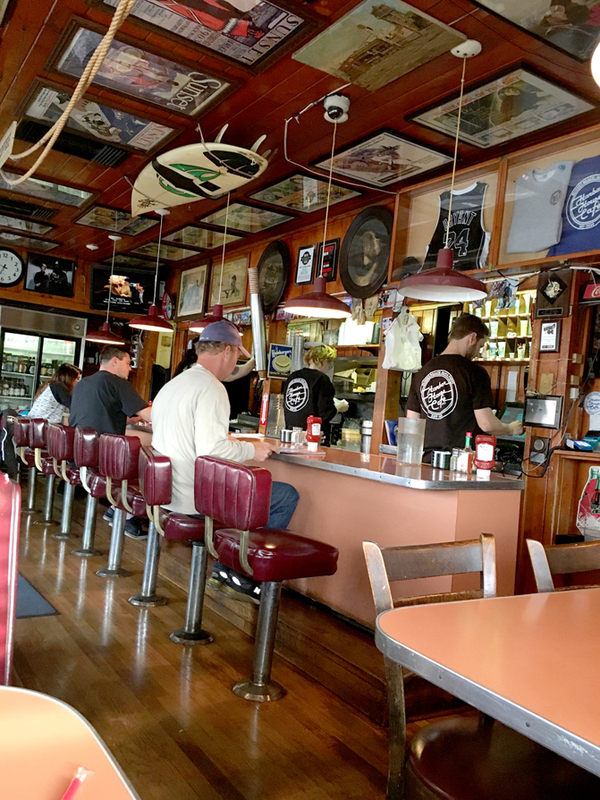 -The menu was huge and I was so hungry after my longer-than-expected drive, I got frazzled and just ordered a patty melt instead of something more interesting. It was fine; the burger was thicker than one usually sees with a patty melt, which made it a little tricky with the bread but I managed. -I sat in a corner booth. A few minutes after I sat down, a family with a kid came in. They were looking for a place to sit, and the kid kept pointing to my booth saying, “sit here! Here!” When one of the adults finally pointed out that someone was already sitting there, he looked disappointed and said, “Oh.” I’m pretty sure he thought they should ask me to move. -Over the bar are two large, round, sepia-toned portrait-style photographs. One is of a dog, the other is of a tiger. -The mother next to me tried hard to sell the kids on “breakfast for dinner!” but the kids just weren’t buying it. They knew this place had cheeseburgers. -Two guys walked in and one of them yelled, sounding drunk, “whose black Z28 is that parked outside? I want to ask if you want to sell it?” They walked around, yelling at people, “is that your Camaro?” and when no one answered they left. I feel like there must be more efficient ways to buy a car. Also, has anyone suddenly decided they wanted to sell their car simply because a guy walked up to them in a restaurant and offered to buy it? I mean I guess they could have been already thinking about selling it anyway but what are the chances of that? -There’s an old-timey looking sign near the kitchen that says “hamburgers you’ll like” with a picture of what I guess must be a hamburger, but it’s an extremely unattractive hamburger. It looks more like a couple pancakes with something unpleasant in between them. -My pen ran out of ink, a note-taker’s worst nightmare. I considered asking the waitress for a pen, but she was busy, and I thought about asking the people at the booth near mine who had hundreds of pens but they had left, and I almost ran out to my car but it was parked too far away for me to just run out to it quickly. In the end I made the rest of my notes on my phone. -It was pretty empty when I came in, and the waitress said it was fine to sit in a booth, but as I ate, more and more large parties came in and I felt guiltier and guiltier. But when the waitress brought my bill she said I should take my time, and seemed to mean it. -As I walked through the patio are I heard a customer earnestly telling a waitress, “It’s not enough to wait on other people, you have to take care of yourself, too!” I couldn’t tell if they knew each other or what. What I Ate: Patty melt, fruit cup. What I Read While I Ate: The Naturals by Jennifer Lynne Barnes, a fantastically exciting book about a group of teenagers who work for the CIA profiling serial killers. There are three in the series so far and I read them in a week; there is a fourth coming and I can not wait. 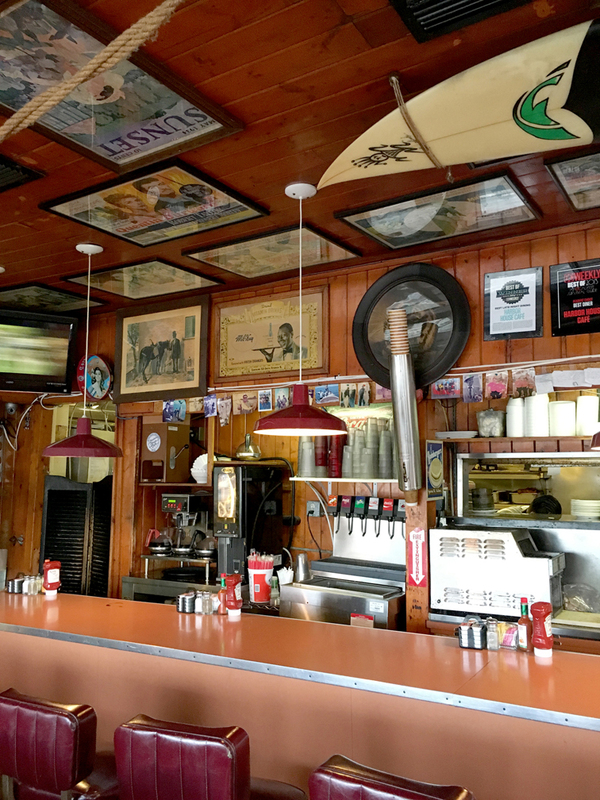 What Sort of Ghost I’d Expect to Find if I Believed in Ghosts Which I do Not: A surfer who went out to surf at the break of dawn every morning for thirty years, and always came here for breakfast after.